We the Biafrans have been living in isolation right from the onset of the amalgamations of this country called Nigeria since 1914 and since then till now we the Biafrans has been the ones preaching peace, unity and harmony by traveling to other tribes in this country befriending, getting married to them and also developing their places why our own place has been like a desert no infrastructures, no government development, no international companies, no good roads nothing good to boosts only what we get in this murderous Nigeria is being hated, mass killing of Biafrans, Hausa Fulani Terrorist destroying our farmland and many other evil things. We can't take this anymore, we have had enough of their injustices, mayhems and their atrocities meted on us the Biafran people and we say no to it, Biafra will never now to our evil oppressors that's why we took the bull by its horns and we are under oath to take our freedom by fire by force because we believed that freedom is not given but taken, that's why we have to fight for it and that is why we the IPOB under the leadership of Mazi Nnamdi Kanu has strived to get our freedom because freedom for Biafra is free to all the oppressed in the world. I'm making a reference base on the statement made by the late Mohammadu Buhari when he was still the President of the zoological republic of Nigeria which he stated that the unity of Nigeria is unnegotiable what unity is unnegotiable please and where is the unity, and moreover how many tribes in this country that are still pledging for one unity because the way I sees it and from the look of things is only the Biafrans that are still pledging for one unity other tribes of no unity. Why the Biafrans have been working assiduously hard to make this country peaceful and loving even though we have been forcefully amalgamated by the British lead by Lord Lugard and his partner in crime the whore Flora Shaw Lugard. These two people with their evil mind to retain power back to Britain took the mantle of leadership and gave it to animals,illiterates and this other name again that suit them yes vagabonds that is the Northerners how can nuisances for crying out loud be the ones to rule of intellectuals how,they did this just to make sure that Nigeria is answerable to them before anything can happen here. We are never relenting neither are we indefatigably slowing down, no way this is a fight we must fight to finish because that is the gateway to our freedom. The Nigeria government and its British counterparts have deprived us the Biafrans of our freedom for a very long time, we have been subjected to all kind of inhuman treatments for no reason, just because of how depraved they are; they have done the unthinkable that they can never be forgiven for anymore. We call upon the world leaders to come and disintegrate this entity called Nigeria once and for all because we have had enough of the bloodshed our people are been slaughtered like chickens by this animal that calls themselves Fulani's peopled who valued the lives of chickens and cows more than the lives of human beings,the Fulani's people are all mentally ill all of them from the rich to the poor all needs as a matter of urgency to visit a psychiatry home for mental treatment because they ain't with their senses. We Biafrans are tired of been in anticipation in waiting for our freedom because right now we are exuberantly ready to strive with our great leader Mazi Nnamdi Kanu the Joshua of our time in restoring the sovereign state of Biafra this year because the freedom for Biafra will equally be for the oppressed in the world who want liberty from their slave masters. 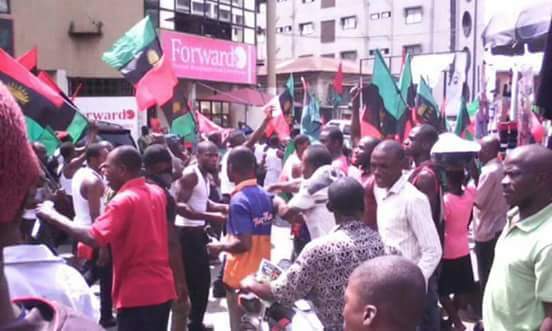 And as for those deranged lunatics in Aso Rock, believe you me when IPOB said that they will reciprocate whether good or bad because the deplorable manners of how you people treat we the Biafrans have been so disastrous that it can never be irreversible even though you intended to do so. Our Biafra freedom still remains sacrosanct that is why we are clamoring for it because through it the entire universe will be safe.